Small Local Sewer Main Cleaning and Lining Project Beginning Soon in Park View | Park View, D.C.
DC Water has determined that there is a need to perform preventative maintenance procedures to sewer mains located within the Park View area of the District. These procedures will require the inspection and cleaning of sewer mains in order to determine whether further maintenance or repairs are needed. Project area streets will include Lamont Street NW, Keefer Place NW, 6th Street NW, Kenyon Street NW, Warder Street NW, Irving Street NW, Luray Place NW, Columbia Road NW and Park Road NW (see map below). 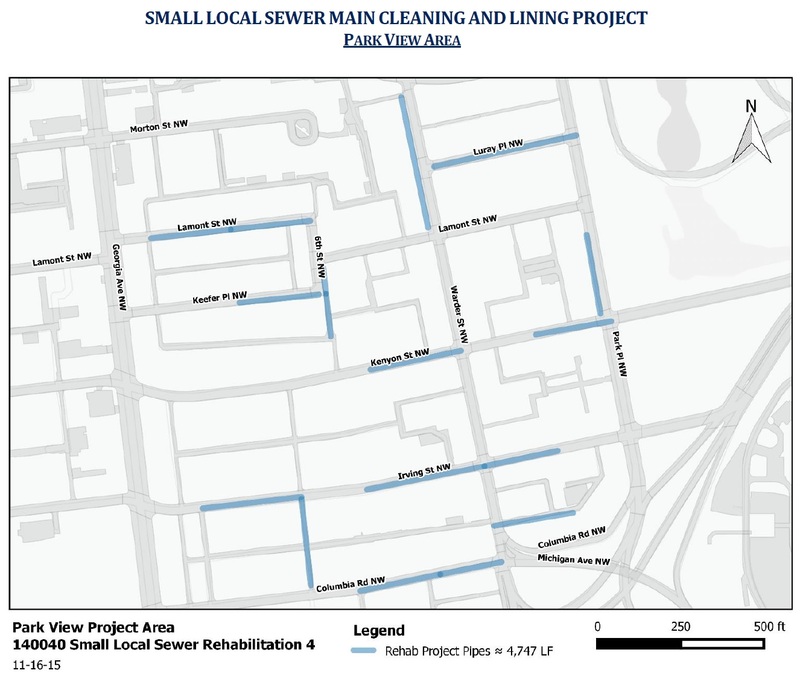 This project will primarily involve cleaning and lining of approximately 4,747 linear feet of sewer mains, rehabilitation of approximately 60 lateral connections, cleaning and lining of 50 manholes. The project is scheduled to start in January 2016 and be completed by February 2016 (Detailed information sheet here). Contractor may work at night or on weekends, dependent upon other construction activities as needed or due to inclement weather. This entry was posted on January 15, 2016 at 7:01 am and is filed under Restoration repair and maintenance, Streets and Trees. You can subscribe via RSS 2.0 feed to this post's comments. Will this shut down any availability to water? I wonder if this will be tearing up the sidewalk in places where we could do tree boxes or ADA improvements. Something to inquire about maybe? Funny, when we had sewer back up into our basement last year DC water swore it wasn’t a problem in their pipes (even though the guy we paid said the clog [word used was ‘fatburg’] was over 60 feet from our tub). I’m glad they are fixing it but man – with all the no parking signs already due to the construction around Lamont and Warder – parking is going to be a pain!